Carlton Smith was born in London in 1853. He studied at the Slade School in London and initially worked as a lithographer before taking up painting. Between the years 1916 and 1823 the artist lived in India. 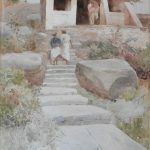 He exhibited at the Royal Academy, Royal Institutes, Suffolk Street and The New Watercolour Society he was elected R.I. in 1889.